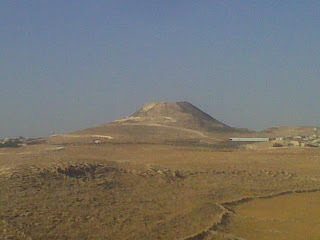 I spent most of the day wandering around, on, and under the Herodion, a partially artificial mountain built about 2,040 years ago by King Herod, and the place he was buried. The day supplied all sorts of interesting insights. Herodion seen from the south. There was always a hill there, somewhat higher than its surroundings; the cone part is artificial, and was built, in two separate stages, by Herod. The story of the mountain, in brief, begins when Herod was a young man and once had need to escape Jerusalem with his entourage. Guarding the rear of the escapees, he turned on their pursuers and forced them to fall back. 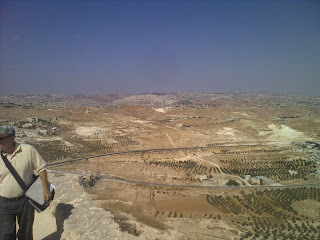 This was near a hill in the desert, some 10 miles south-east of Jerusalem, and he marked the point as significant for him. Later, as king of Judea, he launched on one of the ancient world's largest construction binges, building fortresses, palaces, a port, the Temple Mount, Massada, and also the mountain of Herodion, named after himself. Since it was out in the desert in the middle of no-where (literally), he forced it into prominence by pouring money into it; by the time he was an old man it had a fortress, a palace, a small artificial lake (an early model of the Bellagio, perhaps), a theater, assorted Roman baths, some more palaces and so on. As death approached he undertook the final construction project there, raising the mountaintop so it would be visible from Jerusalem, indeed, impossible to overlook, sticking out as it does over the landscape, and prepared an imposing mausoleum in which to be buried. 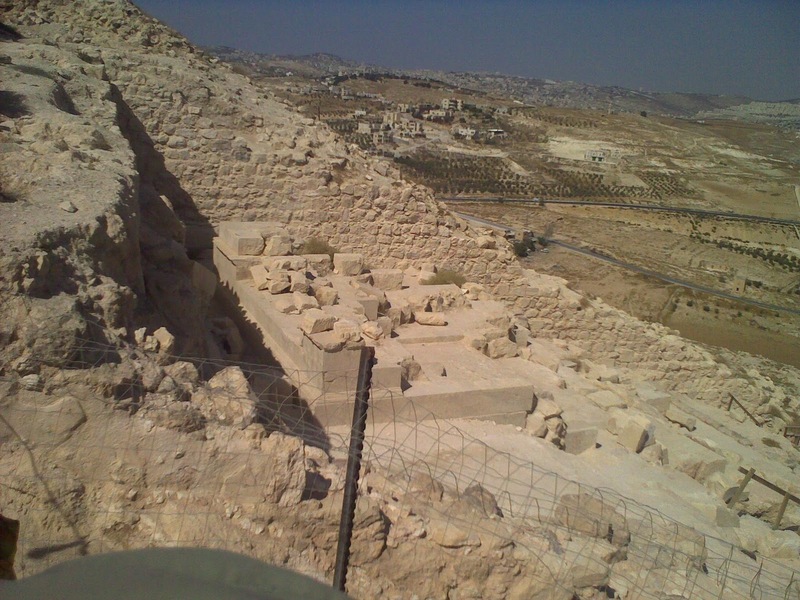 70 years later, as the Jews battled Roman legions during the first revolt against Rome, some of the insurgents holed up on the mountain, destroying Herod's mausoleum, smashing his coffin, and adapting his underground system of cisterns for defense during siege. This didn't help them much. Another seventy years on, during the Bar Kochva revolt, the insurgents added an intricate system of tunnels under the mountain, so as to be able to emerge unexpectedly, kill a Roman or three and disappear back underground. Yet again, this didn't much help them, as the Roman's were known to slaughter insurgents until they were all gone. During the Byzantine era (that's the Roman Empire once it was Christian), the area became a monastic region, with individual and group monasteries way out in the desert a mere day's walk from civilization. The Byzantines, as Christians, had no love for Herod, and they may have constructed a church or two on his mountain as a sign of their victory over him. Then the area emptied, and between 600 and 1900, more or less, no-one lived there except the occasional transient Beduin tribe: there's no water, not much rain, it's too dry for crops, and without the engineering prowess and funds of Herod, no way to pipe water from elsewhere. 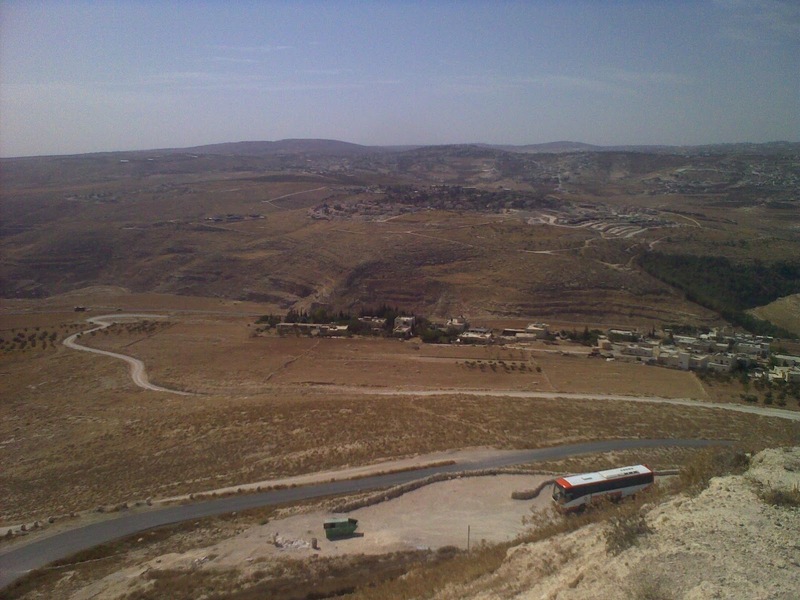 Still, stand anywhere along the south-eastern rim of Jerusalem today and look out over the desert, and you can't miss Herod's mountain. Assuming his point was to gain immortality, he seems to have done so better than most. So what insights did I bring back? The first is about archeology. 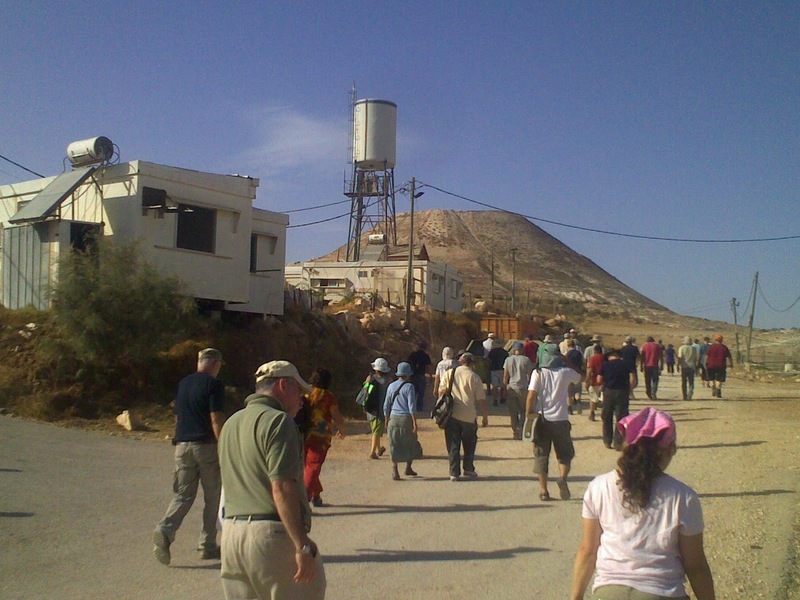 Nowadays archeology has become yet another battlefield on which Jews Palestinians and antisemites clash. Yet archeology is an extremely imprecise tool for such purposes. How imprecise? 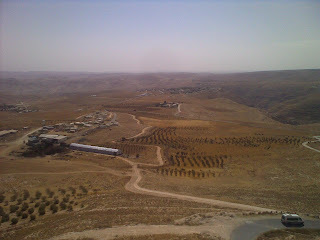 This picture is taken from near the top of the hill (it isn't really a mountain), looking down and west. In the center of the picture, beneath the small village, there's a large excavated square. That was the Bellagio-style pool. To its lower right is an excavation of a monumental building, one of the palaces, I suppose. The rest of the hillside has not been excavated so we've got no idea what's there. We do know however that ever since the late 19th century, and rather intensely since 1972, archeologist have been looking for Herod's grave. Englishmen, Frenchmen, a German (I think), and of course Israelis. The looked and they looked and they never found. Sooner or later, it was inevitable that someone would come along and say: well, if you look for a century and you don't find something, it must never have existed; yet another myth about the Jews in Palestine, huh? Then, in 2007 (! ), they found it. Or rather, they found the pedestal on which it had been between 4BCE, when Herod was interred there, and about 68 or 70 CE, when the Jewish insurgents smashed it as systematically as they could. It had been there all along, near the top of the hillside, at a place no-one had ever dug. Had there been peace between Israel and Palestine in 2000, it's unlikely that Israeli archeologists would still have been allowed to be digging here in 2007, and it might never have been found. So flimsy can be truth and evidence when you're digging for things that were purposefully destroyed 2,000 years ago:they can be hard to find, and their absence is only as convincing as that. (Peace, by the way, would have been preferable, but that's a different subject). Evil Israeli roads: You've all heard about the nasty roads Israel builds in the West Bank, to connect their settlements, demonstrate their dominance, humiliate Palestinians, destroy the natural terrain and generally be obnoxious. Anybody who follows the media's discourse about the conflict has heard these themes repeatedly. The upper road of the two that cross the picture from left to right is dubbed the Lieberman Road by those Israelis who know about it and dislike it (I was first introduced to it by Dror Etkes in 2004, when it was still under construction, and he told me solemnly that it was an Israeli effort to dominate this area). 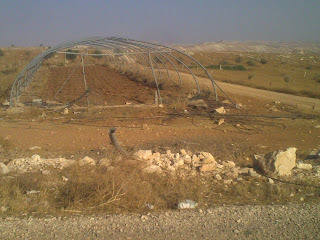 Most Israelis have never heard of it much less used it; on the other hand, the local Palestinians use it, and if Israel ever hands over this area to Palestine, as may well happen, the road will connect the area to El Quds and shorten the ride by about 80%. 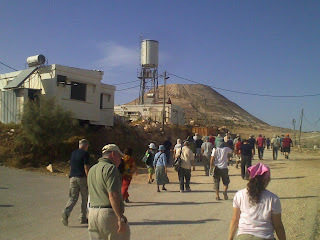 If you're a regular reader of this blog, you've also heard the Palestinian contention, accepted by the Economist and other important Europeans, that the Israeli settlements are hideous, they destroy the view, while Palestinian villages are beautiful and natural. 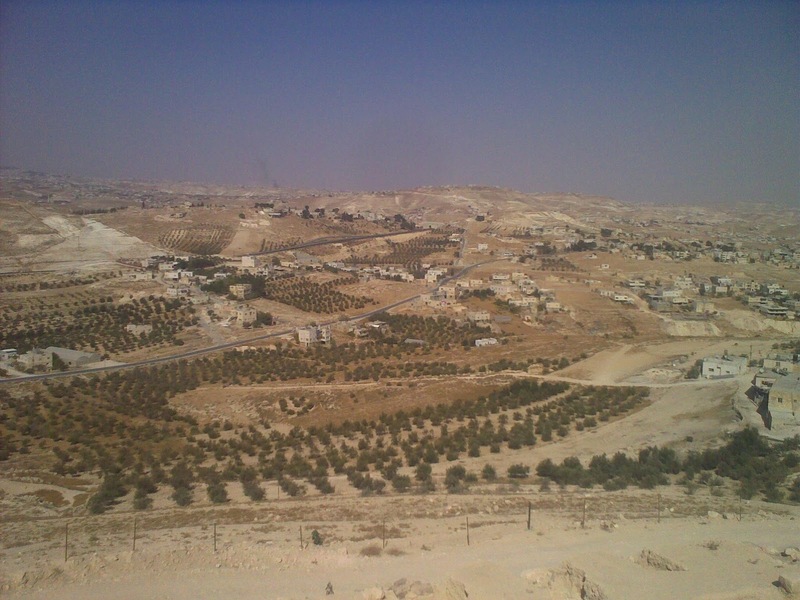 The cluster of homes in the foreground is a Palestinian hamlet; the one on the next hill is Tekoa, a settlement. Next time you're in the area, go out to Herodion and have a see for yourself: don't take my word that both places look equally right or wrong. But they do. Which brings me to the next insight: It's a desert. Until modern water systems were invented in the 20th century, nobody lived out here in permanent residences, and hardly in tents, either. 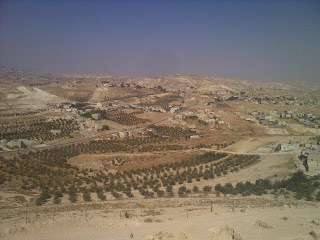 Which means, the Palestinian villages are as recent as the Jewish ones in this area. 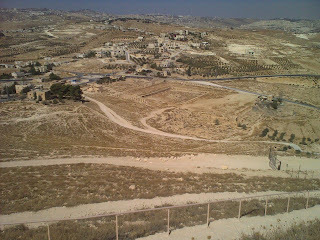 I personally remember that Herodion was out in the desert; nowadays its north and west sides are lapped by Palestinian villages and olive groves. But note that they're young olive groves, trees which have been there a decade or two, mostly. They haven't been there from time immemorial. The Palestinian population on the West Bank is growing rapidly (though less rapidly than 20 years ago), they can pipe water out to the desert, so they're moving deeper into it. I'm not saying there's anything wrong with this, but it is a fact. 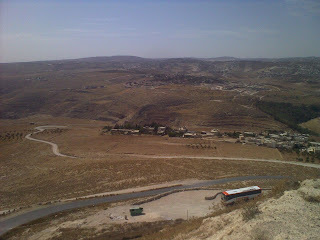 This picture is to the south east from the mountain. In the background is Nokdim, whee Avigdor Lieberman lives (hence the cynical moniker for the road), and all around it is...empty. I'm not saying this means it shouldn't someday be part of a Palestinian state at peace with Israel; it should. But no-one's being forced off their land or hemmed in by Nokdim. It's in the desert. Otherwise empty. Remember: in all the history of mankind, no-one has ever lived permanently on this hillside. The people who do so now are two bunches of folks: a group of severely troubled teenager boys, who have been thrown out of every conceivable institution and mostly also out of their families; some have already been in jail; and their hosts, a handful of idealists who have decided this hilltop in the desert is the place to give them a last chance at a normal life. They take in the boys, tell them this is home so they need to take care of it and participate in its upkeep, and move them from a track to career criminality back to normal society. They've been there 13 years, and have mostly been very successful, saving, by now, probably a few hundred young men. They do so by putting them to work. Some work with the goat herd. Others produce goat-milk products, including fine cheese and yogurt. Others produce "gefet". 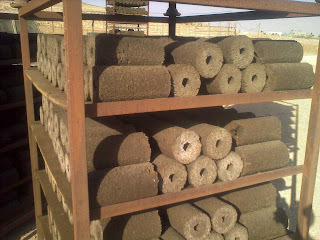 Gefet is an ersatz wood, used for heating, charcoal or even production of soap, produced from the waste left over when you turn olives into olive oil. The waste is a pollutant, and burning wood to heat wood ovens means cutting down trees. 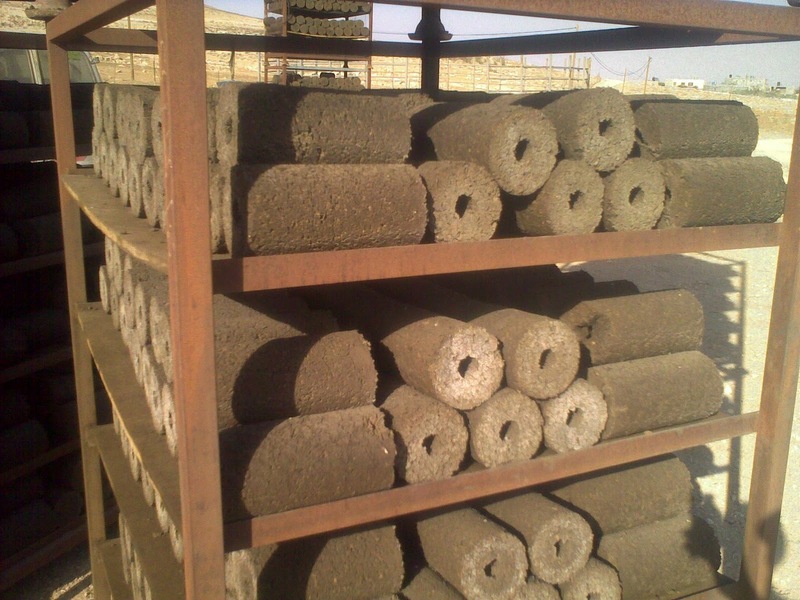 So these folks have figured out a way to make the olive waste useful, and save trees. They're green, or cleantech, or whatever the word is. The type of folks the Guardian should be enthusiastic about - but isn't. ... and you don't give much thought to the endless chatter about how evil the Israeli settlements are, and how they oppress the poor Palestinians. Couldn't Sdeh Bar be just as inspiring l inside Israel proper, though? The West Bank is a complicated place. Sdeh Bar sounds just great though. Fine. Couldn't Sdeh Bar be just as inspiring inside the Green Line, though? Thanks Yaacov. I always loved Herodion and the surroundings whenever I came there. It happened in February 1996 that I did believe in the Oslo process - for one week. 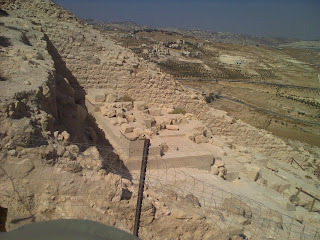 I travelled to Herodion and through Yehuda with a rental car. It was a Monday. That evening I met friends in Jerusalem and told them "Despite all my suspicion, it might work". The following Sunday, the bus NO. 18 exploded in Jerusalem, then the next one, then the Purim bombing on Dizengoff in Tel Aviv. I was cured.